OVER 3000 SYSTEMS INSTALL EXPERIENCE. Installing Electrical Repair in Brisbane is still a viable option if you use power during the day. When you are in the quest of electricians or an electrical contractors expert to address your electrical issues and needs, you will definitely research, call and seek experienced electricians from your neighbourhood. And after a detailed search or based on references you may contact electricians to undertake electrical services in your home or office. If you are residing in the Brisbane area, and are looking for an electrician, who else would be a better choice than Brisbane Solar, the Electrician Brisbane specialists. Because with Brisbane Solar you have come to the right place and made the right choice. We are known for our exclusive offerings. From being the leading electrical contractor to setting up solar powered equipments and solar conditioning, we are experts in our field. We have onboard experienced electricians who have a good knowhow of the latest in electrical equipment and installation. We are definitely sought after as electrical contractors in Brisbane. LED lights are the latest in lighting systems and come with an array of benefits, colours and styles. And it here our experienced electricians will undertake the job for you. Whatever the work you may have, if the work done by the technician then it will become successful story. 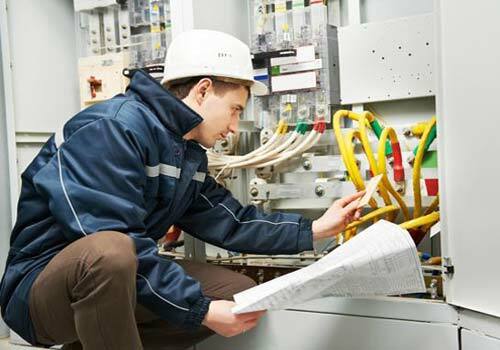 If you are looking for the electrical works in Brisbane, hence we provide you among the best electricians in Brisbane. The experienced electricians at Brisbane will understand the importance of maintaining your electrical system in a proper way. Hence we undertake all kind of electrical works for residential, commercial and industrial purposes. When you feel the electrical works has to done in a proper manner then the right choice will be the electricians at Brisbane. With more than a decade of experience our professional electricians will be favored at the exact situation as you expect. Our electricians will provide the suggestions on electrical goods which will fit for your place and accordingly the works will be done. So… What you are waiting for? Need of Electrical Works? Wanna Get Rid of Electrical Problems? Our Electricians will hit your door steps sharply for the specified Electrical works at your area. ► Ceiling Fans Install or Replacement. ► Power Points Installed or Replacement. ► Light points Installed or Replacement. ► Renovation or extension wiring. Reliable prompt service. Brisbane Solar & Electrical believe in doing the job right, so you are happy and recommend our service to others.